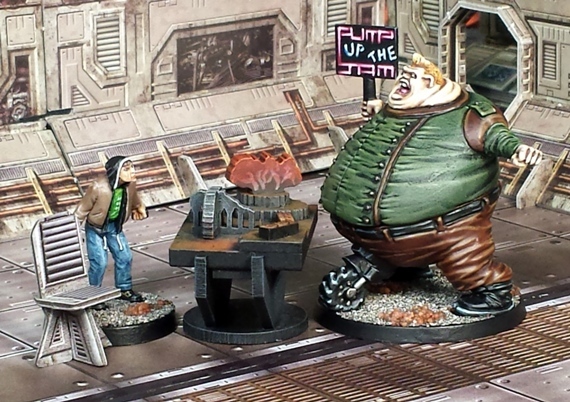 My next sci-fi non-combatant miniature is this big-boned protester from the Judge Dredd universe. 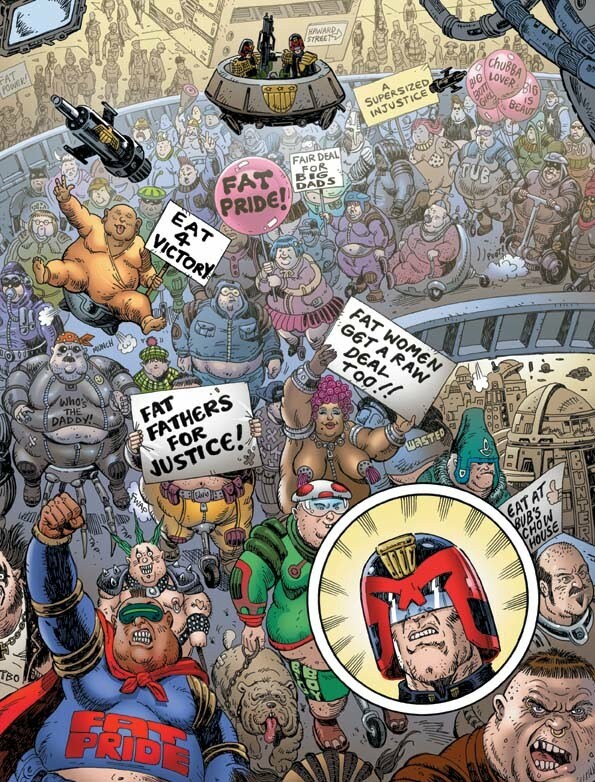 Competitive and recreational overeating are features of daily life in Mega City One. Despite the nanny state banning of sugar (something that used to seem ridiculous to me when reading in the eighties, but somehow looking a lot more plausible these days) and other unhealthy foods (all commonly available foodstuffs in the Big Meg are made from “Munce” – artificially grown “treemeat” – or similar) many choose to eat their way through life, using “beliwheels” to aid with carrying them from one location to another. 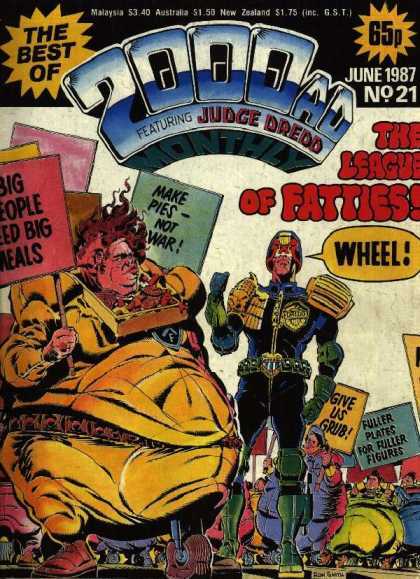 After the Apocalypse War rationing in MC1 led to rioting and the moving of the eating competitions underground, which led to Dredds early run ins with Fatties in the comics. 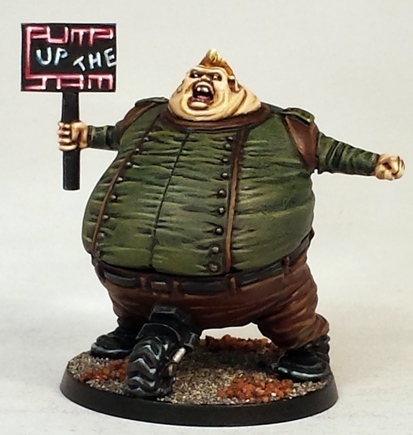 As a result the Fattires have long been associated with protesting, which is why both the Citadel and Mongoose miniatures ranges both made Fatty models with placards, as visible on the Mongoose model shown. The model is huge in more than just girth, it seems to represent a character who is about two and a half metres tall. Like many miniature scale issues, I choose not to let this bother me too much. 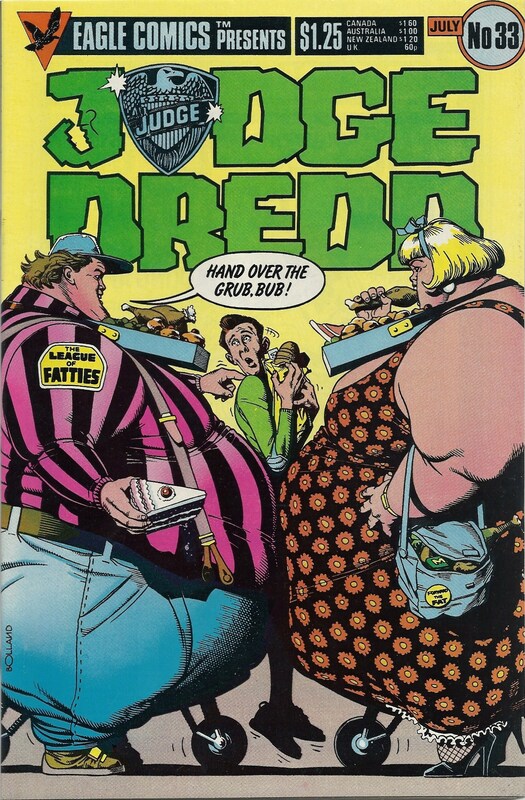 The anatomy of Fatties has never looked quite right to me in the comics. I have always assumed that in order for the concept to work that Fatties must use various futuristic types of steroid (such as the often mentioned “Flabbon” and appetite inducers) to end up the way that they do. In an environment where Uglies and face-change parlours are de-rigeur, assuming that there are processes at work that alter the stature and structure of the Fatties body isnt much of a leap. In keeping with previous and future protesters, the slogan on the placard is an 80s/90s dance music reference. This time I managed to get a reference to conserves in too, which pleased me. The model will possibly be used in an upcoming game set in a rioting Necromundan underhive, as being run by Axiom from Magpie and Old Lead. 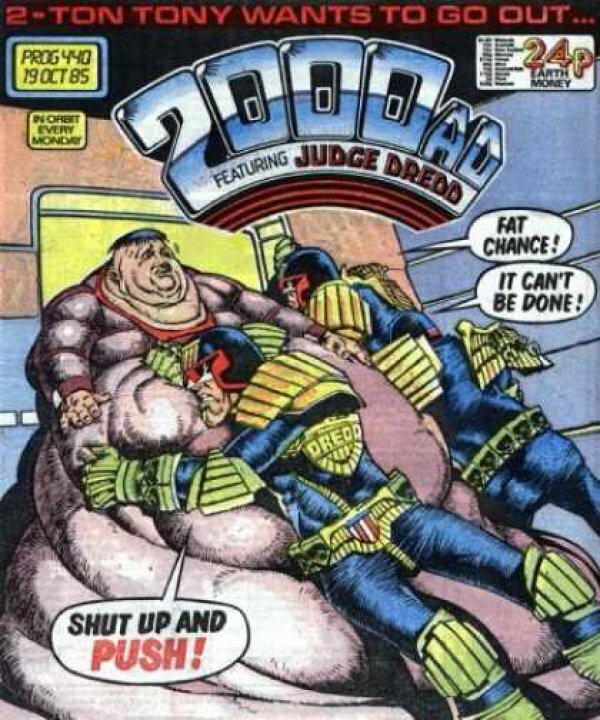 The Fatties look a lot more Dredd than 40k, but I figure that he can be imagined to be a genetically modified dock worker or something. You dont need to be in Psi-Div to know whats going to happen next. The writing on that sign is absolutely brilliant. I’m loving this project. When the phrase for the sign occurred to me it made my wife laugh – she can be a tough audience – so it had to stay. Painting it to look like a card from a “yoof” tv show from about 1989 sealed the deal I think. ‘Suddenly, the reasons why Paul had given up playing tournament 40K came flooding back…’ – I nearly chucked my tea laughing at that one. I like the Mongoose fatty models quite a bit. To me they are just right, scale-wise. I like the colour choices, again, more earthy than you normally go for. The extreme highlighting on the belly wheel and boots give him such pop as is needed, and the signage, well, it works on so many levels. Nice. It’s a matter of some consternation to me that you’re so ahead with the JD project that you can post Dredd models in regular posts. But then, I’m never going to match your output old bean, and it does mean more models to oogle. The tournament gag is a little unkind really, but I couldnt resist. The figs are on the large side, but as can be seen in the comic pics, Fatties tend to be huge vertically as well as horizontally. The fig look the part, it looks just like how I have imagined them since I was a kid. I went earthier with this fatty so that it would jar a little less in Axioms planned game, which is set in a 40k environment. The rest of the fatties will conform to a more familiar MC1 palette I suspect, but as you know, anything goes in MC1 fashion terms. 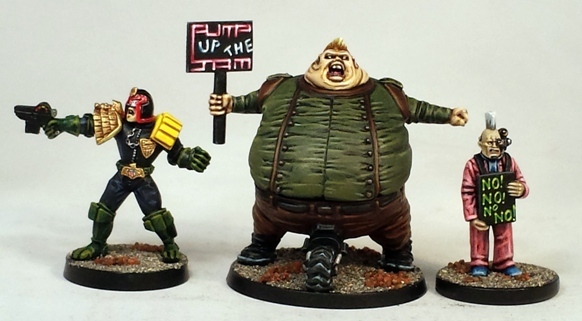 I should have held back this model to include as a Judgement Day post, but as I have three more non-Dredd based protesters to paint I decoded to throw caution to the wind and include it as part of the sci-fi non-combatants. I may yet regret it when I get distracted by other things as time progresses. Thanks for the feedback Mr S! I can’t wait to see the larger gentleman waddling around. I suspect I may need some model-specific movement and line of sight rulings! The paint is cracking – I love the attention lavished on his shirt (XXXXXXL)! The shirt was primarily painted while drinking wine in front of the TV last weekend. Without the anaesthetising effects of the booze taking the edge off I may not have had the patience to paint the guys shirt at all. Check out his trousers, I was much lazier when painting that. Smoke and mirrors. Thanks Warburton, Im glad that you enjoyed it. This model hits a couple of sweet spots I think. I put off painting any of those Fatty models for years as I didnt think that I would enjoy painting them, but once the wrinkled shirt was done it was quite fun. Im looking forward to painting another large futuristic gentleman in the future. The fatties’ anatomy is odd because if you try and envision their skeleton it comes out looking like a Terminator Marine. Distended shoulders and hips, etc. I guess the drugs they take to get super fat could have osteotropic effects too. Eh comic books, still better than Liefeld’s grasp of anatomy. Osteotropic, nice. I wish that I had said that. Thats exactly what I meant though, just like SM Terminator physiology, Fattie skeletal structure is bizarre. Not worth getting worked up over obviously and like I mentioned in the post, there is plenty of precedent for spurious, pseudoscientific in-setting explanations. Those judges are nice, the palette is nicely saturated. The sculpting styles on the judges do differ a bit, but being a pedantic fan of the franchise, I can say with certainty that I had no ‘what the f**k is that bit?’ moments. Tumbler is alien to me. Its something that other people do.